This is definitely going to be the Summer of dips! I’ve been playing around with so many combos recently and this one stands out so I want to share 🙂 I made it this weekend for a friends son’s birthday party and the bowl was licked clean (always a good sign!) And the best reason for making dips from scratch?? No crazy chemicals in those little packets or bottles! Did you know that most of those packets have MSG (blah!) in them??? Well, here’s a super simple recipe that I hope will please your crowd. And if you notice, yes, I serve this dip and most others with potatoes. They are simply boiled potatoes, but they are one of my favorite dippers! It’s like having deconstructed potato salad 😉 Hope you enjoy! Caramelize the onion. In a frying pan on medium high heat, add the onions and about a tbsp. of olive oil. Sauté until soft, then turn the temperature down to medium low and let Dr. Caramel do his thing 😉 Which means stir every few minutes or so for about 15 minutes or until the onions develop a caramel color. While your onions are caramelizing, combine the spinach, lemon juice, and whipped avocados in a large bowl, add the onions when ready and stir. Add vegenaise if it needs to be a little creamier. Stir in the paprika, salt, and pepper. Chill and enjoy! Looks delish! 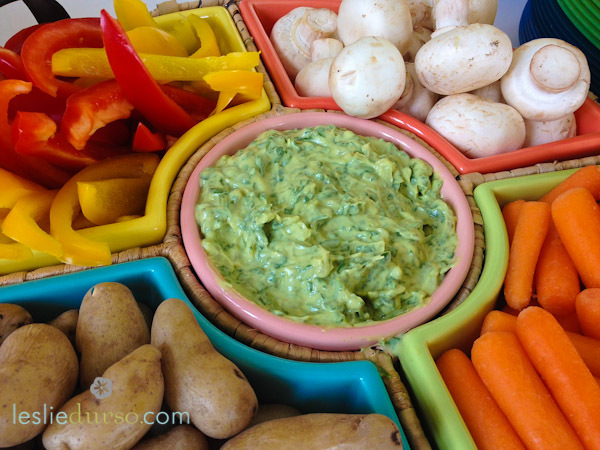 I love using avocado to make creamy dips! Mmmmmm.